By southerners the area above the Arctic Circle has traditionally been regarded as wilderness: A land of nature. On our Diamonds of the Arctic Tour of 2014, Angelo and I visited a number of art galleries. People living in a different, harsh and unique landscape are bound to be creative. An artistic culture must inspire to great works of art. Korundi of Rovaniemi is at the very upper echelons of Arctic art, any art. It is an institutional center of art. The newly renovated building is the home of two major art performances. 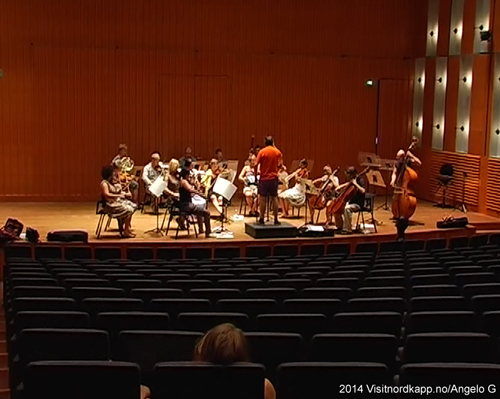 The Lapland Chamber Orchestra is a world recognized chamber orchestra. The Rovaniemi Art Museum collects some of the better contemporary Nordic art as a whole. We were filming at the museum. The very first thing we digitalized was the chamber orchestra rehearsing before a rare and monumental performance at the Proms in London. For those who aren’t into classical music, it is the equivalent of the Olympic Games in sports. Ms Katri Kerola (marketing), enthusiastically, told us that the orchestra had recently competed with orchestras from Los Angeles and Berlin for the Gramophone Awards. This is the equivalent of the Oscars in the film industry. If you love classical music and want to experience the Arctic, check the schedule of the orchestra and go to Rovaniemi when the orchestra is playing. We were guided through the museum by both Katri and Ms Kaija Kähkonen (curator). Paintings, sculptures and other work of art is bought by a fund. 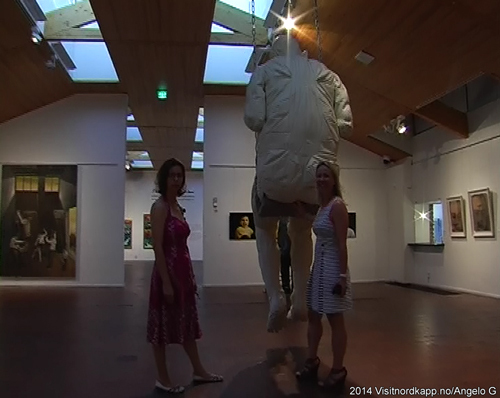 The most educated and professional art connoisseurs in Finland are buying contemporary art directly from the artist. So far the museum has a collection of 3 000 pieces of art. Rovaniemi was lucky to be able to host this collection. At the time of decision, many towns in Finland wanted to be the premier home of Finnish contemporary art. There are two main ideas behind this collection. One is to give the public access to the best contemporary art. 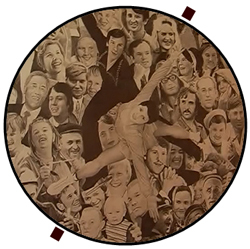 Two is to finance the artist directly for their art, inevitably, spurring more works of art by proven artist. The exhibition changes, on this warm august day in 2014, the museum had a collection of the late Mr. Reidar Särestioniemi. One of my favorite artists, he is worth a visit alone. It is difficult to write about art, to communicate the work. Copies may be able to transmit the vibes. Film as we did, may also project the art. One illustrious image is of the sculpture Katri dubbed as her boyfriend. The best is of course to experience art first hand. As I see it, art is feelings that are hard to put into words. At Korundi they have the ultimate offer in regards to this. After touring the art, you are invited to the art workshop. Here you can try to express yourself: By paint, ceramics and other substances. Kaija, the art curator, was endeared to this part of the museum. An offer kindergarten and schools are embracing. However, as they said, it is also available as a team building alternative for businesses. And for the individual and group traveler. The Korundi building has a remarkable story of its own. It used to be a depository for buses and trucks. In 2011 it was rebuilt to house one of the most significant art buildings of the north. The Arctic is also high end culture. Are there any other buildings in the Arctic that have made such a transformation?